To recap: John Tory has centred his Mayoral campaign on a promise to build a heavy surface rail (he calls "surface subway") electrified line 53KM long that mostly uses 2 existing GO-Transit non-electrified lines and builds 12KM of new track along Eglinton west into Mississauga terminating just south of Pearson aiport. He claims to need $8 billion to build it, and expects the City, Province and Federal governments to each pick up one-third ($2.67B each). There are several technical (some, like capacity at Union station, quite serious) concerns about the viability of the specific route & stations he proposes, but more importantly is how such a large sum could be funded, several times more costly than any transit project in contemporary memory (possibly the Yonge or Bloor lines would be equivalant if you do the inflation adjustments). How does Tory expect to raise the cash? This is the most mysterious part of the funding plan, that has received only scant attention. Why does Tory expect to be able to get $2.67B out of Ottawa? This is multiples of what Ottawa has ever provided to Toronto for any project. There was dancing in the streets last year when Flaherty announced $660M for the Scarborough subway, and that wasn't some "favour" he was doing for Ford, it was money already allocated to Toronto out of an existing national infrastructure funding program that every city can draw proportionally from. Toronto is probably due a bit more money from that program (the "Building Canada" fund) but I can't figure it to be more than a few hundred million. If Ottawa is going to come through this will be net new funding. Tory harps on his good relations with Harper, and 2015 is a Federal election in which the Tories are already trailing badly in the polls, so it's possible Ottawa will try to buy some GTA love but that's a lot of money for a city the rest of the country largely dislikes and the couple competitive seats for the Tories in Toronto may be cheaper to buy elsewhere. Pinning all our hopes on this seems far fetched. Ottawa has previously committed $333M to the Sheppard LRT project, which would certainly be available if the Sheppard LRT is put "below the line." More on this below. Still, I can't even come close to $2.67B out of known pools of money for Transit from Ottawa. This is a big problem for Tory and his blithe certainty that he can wrest vast sums on the strength of his personal connections should be viewed with skepticism. The re-elected majority Liberals have committed to a substantial long term GTHA heavy transit funding plan, so in principle there are the requisite billions of dollars in existence of budgeted money for Transit. The issue is that those billions are spoken for in other, already planned projects. Something would almost certainly have to be defunded in order to provide the $2.67B for the province's proposed share of SmartTrack. Given the debt/deficit panic and various warnings of lowering Ontario's credit rating, and the government's election pledge to balance its budget by 2018-2019, it's almost impossible to imagine them agreeing to a new multi-billion dollar transit allocation for Toronto. Another key fact is that the province has committed up to $12B to electrify the entire GTHA GO train network of 7 lines and provide 15 minute all-day service on them, aiming to do this in 10 years (which they admit is ambitious). Ontario has committed to frequent, all day service on all this, regardless of who is elected Mayor. The vastly most likely thing to give way in this would be the approved & (currently) funded projects to build LRT lines on Finch avenue west & Sheppard avenue east, two Miller-era "Transit City" projects that died under Ford and rose again from the dead when Council overthrew his control over transit in 2012. Between the two projects there is about $2.5B in current provincial dollars (plus the $333M Federal for Sheppard). John Tory has made clear that not eating up precious lanes of road space for cars is his top priority (see his Eglinton Connects rejection statement) and even told Spacing back in May that he would push to "delay" these lines in order to make a "Yonge relief line" (which somehow later became "SmartTrack" but let's leave that issue) the priority for funding. He was later quoted saying they "aren't his priorities." More recently he told Daniel Dale in the Star that none of this was true and that he "supports" these lines being built and "has no intention" of asking to delay them. Cynically reading between the lines, this leaves open the possibility that if the Province suggests yanking the funding to these lines, Tory would "reluctantly" agree. He clearly is not going to go to any lengths or expend any political capital to see these lines built. At best his position is "cancellation if necessary, but not necessarily cancellation." Let's read some tea leaves here: The province very likely does not want to build these lines either. The Transit City master agreement was cut in early 2007 by the previous Premier's government, in the shadow of a fall 2007 provincial election in which the Liberals would be facing down an affable & charismatic conservative party leader by the name of John Tory, a well known "red" Tory moderate, the kind of guy who could bury the nasty reputation of the Harris years and return Ontario to its decades long reign of non-stop PC governments up to Bill Davis. Tory even worked for Bill Davis himself! Tory's 2007 loss is considered one of Canada's epic political blunders over the religious school funding issue, so it's not as if the 2007 era Liberals were wrong to fear him. In short, Miller cut an awesome deal for the city in 2007, with a government that was afraid of what it was facing, and eager to shore up the key 416 ridings (often ripe for picking by the NDP). 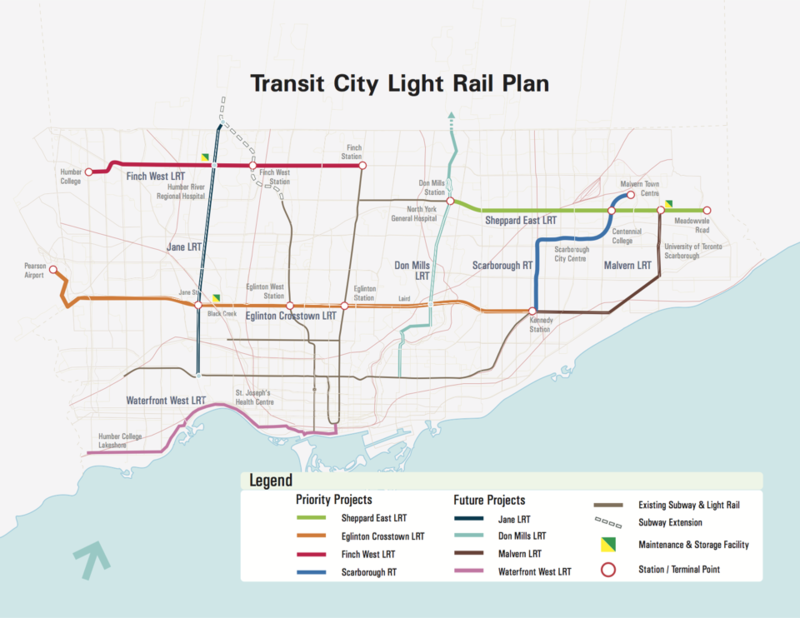 The deal for these LRTs sees Toronto paying nothing to build them, not responsible for any cost overruns, and the Province even picking up the ongoing capital maintenance and sharing in the operating cost of the lines, which would be run as TTC lines. In short: "Free" rapid transit. Plus getting Ontario back in the game of funding some share of TTC operating costs is a big deal. Higher governments aren't fond of paying operating costs for things they don't own/run, there's no glory in it. Capital funding is fun, you get ribbon cuttings and comemorative plaques. Operating funding is a budget item voters don't notice. Add to that these are two rapid transit projects solely for Toronto of no practical use to those ultra key 905 ridings, where governments are made or broken in Ontario. SmartTrack on the other hand is actually a regional line (and Tory says it would be run by Metrolinx, which likely means it will be branded as a GO Transit line), going to vote (and donor) rich Markham & Mississauga. The incentives are all for killing these lines. Sure, they'd call it a "delay" - but given that there are signed agreements in place (including with Bombardier for the LRT vehicles) there would be real penalties to any delay. Further, any capital project put "below the line" of actual available funding is heavily unlikely to ever come back above. At the very least you are talking about a delay of at least a decade before fiscal and political conditions might allow these lines to be refunded, and by then the EAs won't be valid and frankly the areas may have changed such that these projects no longer make sense anyway. You can scan the list of "Big Move" projects but you won't find anything else anywhere near as juicy a target. Tory can deny this is where he expects the Provincial share of money to come from, but it's difficult to imagine it playing out any other way. Here the game is about the "Tax Increment Financing" (TIF) scheme. Tory is pledging to raise $2.5B of Toronto's $2.67B share from TIF, under a never used 2006 Ontario law that actually currently can't be used because the province has yet to implement some key regulations on it. The recent (must read, go, read it if you haven't) Marcus Gee piece in the Globe and Mail reveals that the primary intended beneficiary of this law was Toronto, but it has never been put into use because the city and province don't agree on how it should work. The key dispute has to do with the nature of property taxes. TIF schemes rely on the idea that if we build something good, the property tax draw from some area will increase more than it would have without building that thing, so let's assume that growth as securitization for borrowing the money to build the nice things. It's something like a student loan: Loan me vast sums today so I can pay to educate myself, and pay back the loan from the high income I hope to earn with my fancy degree. In Ontario, property taxes have two components: A provincial share to pay for education, and a municipal share to pay for municipal government. The property owner pays one cheque, but it is divided between municipalities and the province. Toronto wants the TIF money to be loaned to the city by the province and the province to recoup the money out of increased property tax revenues on the provincial (education) share of the TIF area. This puts the risk on the province, if the expected property value growth does not occur, the Province would have to deal with the fallout of reduced property tax funding available for schools (a common TIF problem in the US). Naturally the province would prefer the city shoulder this burden. Further, Tory's scheme requires more than doubling a limit Ontario put on the law that you can only TIF finance 1% of your normal municipal property tax take for your city. Toronto's property taxes amount to about $3.7B so this is about $37M a year. SmartTrack needs more than double that per year over 30 years to make the $2.5B. It's hard to see how the province can agree to the city's position because in practical effect, in order to provide Toronto with $75M+ a year in TIF funds, Ontario would have to borrow this money too. If the province's position wins out, the usual problems with TIF schemes for cities rear their ugly heads: You often end up depriving the future city of needed property tax revenues, particularly if the expected revenue growth does not materialize. Again, Tory's answer here all seems to be that by dent of his great relations and awesome leadership skills, he can chivvy the province to agree. I don't know what Plan B is if this fails. Cancel the Scarborough subway? He probably should propose doing that given how SmartTrack more or less makes that line redundant given the existing routing of GO lines in Scarborough, but unlike Finch & Sheppard, Tory has been definitive in committing to build the Scarborough subway extension, so it would be a big promise break to reverse on that. But it would free up $3B in funding. Who is Tory appealing to? His messaging isn't as blunt as Ford's "downtown versus suburbs" war, but Tory has made dogwhistles to that, implying that he provides Transit to "all" Toronto not "just" downtown. Naturally the point that the "downtown" relief line is of primary benefit to suburban commuters since people who already live downtown don't need rapid transit to get there is generally lost in the city's unfortunate urban/suburban divide. Further, SmartTrack is calculated to appeal to drivers who want new transit, built in ways that doesn't close roads during construction, and that hopefully other people will ride so "their" roads get that much clearer. SmartTrack is probably not, in isolation, a terrible project as potential transit lines go. The grand context though is to ask "what are the alternatives? What else could we do with that money?" At a (politician derived, unverified) cost of $8B, it is nearly as much as the TTC 2012 estimate of the "full" relief subway loop from High Park down to King, and across back up to Pape and all the way to the Eglinton LRT. Given that the province will electrify the existing GO network and plans some kind of TTC fare integration, what are we really getting for our $8B? 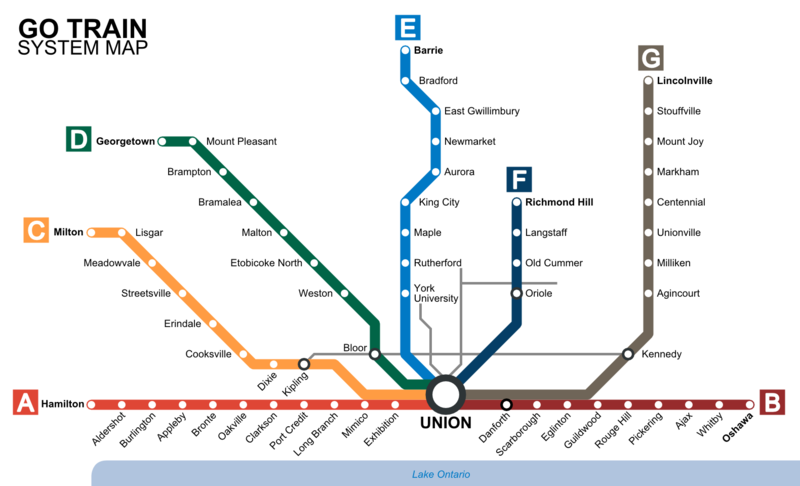 A few extra stations, no need to change trains at Union to continue on to Markham or Mississauaga if coming from the other side, and those 12KM of new track along Eglinton into Missauga. Oh and maybe it's built a few years sooner, if Tory's ungrounded pledges that it can be built in 7 years hold up. The smart transit people I read all seem to say "electrifying GO lines is well enough, but we need that AND a relief subway" - and they were saying this before SmartTrack was a thing so the assessment is independent of feelings about John Tory. Tory's line would almost certainly preclude any realistic funding path for that relief subway (and no, it is not a replacement for it, it would only "relieve" a small fraction of the burden on the Yonge line, and further Union station will be overcapacity by 2031 without a relief subway along King). No, the opportunity cost is far too high and the payback is far too little. We're already getting 90% of this from the Province anyway, and we'd have to give up 2 approved transit lines to some of our most at-need neighbourhoods most cut off from the city's rapid transit system. This is not the best deal for Toronto, even though it might be a good deal for John Tory, Kathleen Wynne, Markham, Mississauga & Stephen Harper.